Besides its amazing landscapes, it is known for its treasures of colonial churches, palaces, convents, paintings, sculptures, and carvings, which is why it has been declared a World Cultural Heritage Site by UNESCO. Located in the Andean mountains at the foot of Mount Pichincha 9200 feet above sea level, making it the second-highest capital in the world. 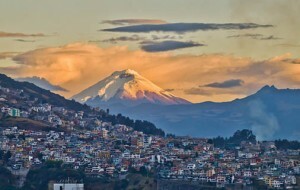 Quito is the only site on the planet where the Equator crosses over highlands. 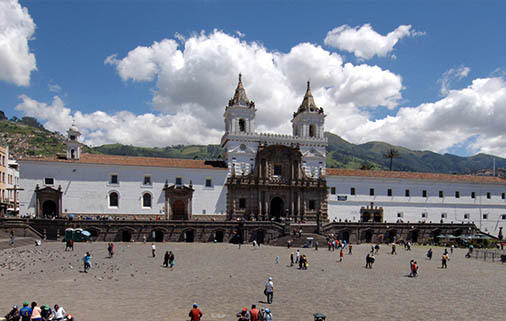 Quito´s old town is one of the biggest and best-preserved old towns in Latin America. Old Quito has many colonial buildings and a huge market with a lot of hustle and bustle. Go north and you end up in the new centre (La Mariscal), where tourists will find many hotels, restaurants, travel agencies, and night-life. WHERE TO STAY: As befits a capital city, Quito has a wide variety of hotels and hostels (in Spanish also called hospedaje or hosteria). Most hotels can be found in the new city centre. The area around the Amazonas/Colon junction, called La Mariscal, is the place where most foreigners hang out, since it also has many restaurants, internet cafes, travel agencies, and bars. Plaza de la Independencia: This is the main square in Quito´s old town, located in the centre of town just in front of the Presidential Palace. It is surrounded by churches and government buildings. Iglesia La Compañia: This church has been catalogued by UNESCO among the hundred most important World Heritage Site Monuments in the world. The interior, which is entirely gilded, shines like a jewel, and its paintings, sculptures, altars, and cupola. The façade is a marvel of the American baroque and plateresque styles. The marvellous harmony of baroque richness , all in gold fascinates and awes the visitor. Mirador de Panecillo: El Panecillo is an excellent way to get to know the dimensions and the layout of the old city. 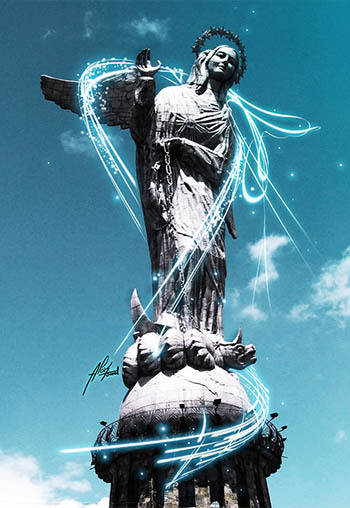 The Panecillo hill – which in the Inca’s time was a temple of adoration to the called Sun Yavirac- has on its peak a gigantic image of the Virgin of the Americas that is the only winged Virgin. Equator – “Mitad del Mundo”: The small town gets its name from its location at latitude 0°. A monument of 30 meters of height, topped by a five-ton globe, has been built to mark the spot. One of the attractions and mysteries of the city Mitad del Mundo is that during the equinoxes (21st of March and 21st of September) people and objects do not project not even the minimum shade. You can also visit the Museum where the real Equator Line crosses. Teleferico (Cable Car): Take a tour of approximately between 8 to 10 minutes in 2.500 linear meters, the teleferico gets up from 2.950 meters to 4.050 meters of altitude, 2 cabins of load. Here visitors will find zones of amusement, as a park of mechanical attractions, commercial walk, the possibility to do horse riding or hikes in the mountain. Copyright © Terracentro Spanish School ® 2015. All Rights Reserved.